Studies show about 90% of us are not eating enough fiber. 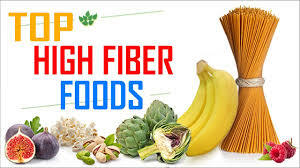 In my last blog, I listed fiber as the number one “nutrient” of the 17 nutrients most studied and documented as essential for overall health and wellbeing. As you can see in the table below, adding more fiber-rich foods to your daily diet can help with several of the top ten reasons people regularly see their doctor. Interestingly, you'll also find many of the symptoms which prompt millions to seek help from over-the-counter remedies. Fiber in foods is found in different forms such as pectin, hemicellulose, cellulose or lignin. For optimal health you need to consume adequate amounts of both soluble (dissolves in water) and insoluble (does not dissolve in water) fiber. Younger vegetables often contain more soluble fibers such as pectin and hemicellulose. Insoluble fibers such as cellulose and lignin are often more prevalent in riper vegetables or fruits. Overall, the more mature the vegetable or fruit, the higher the total fiber content. The fiber in your foods can be partly digestible or completely indigestible. Partly digestible fibers include pectin, hemicellulose and cellulose. Lignin is not digestible at all and even lowers the digestibility of other fibers. NOTE: The fiber content of any food varies according to growth conditions (climate, soil, etc), times of harvest, species, etc. Even though the nutritional value and effects of fiber on your body vary greatly, daily intake of dietary fiber is a known and proven requirement for a healthy lifestyle. Dietary fiber can provide health benefits for Type II diabetes, constipation, cancer and numerous other health problems. Since the mid 1990s Daily Reference Intakes (DRIs) have been developed to replace Recommended Dietary Allowances (RDAs). The following table will help you more accurately determine what your DRIs for fiber should be. In summary, the best goals for consuming healthy amounts of daily fiber for children is 19 - 25 grams; men 31 - 38 grams and women 21 - 29 grams. Most people, especially in more westernized societies like ours, are eating less than half these amounts. The following tables do not include all the fiber foods available but can definitely help with more choices for increasing your total dietary fiber. NOTE: Whenever possible, always choose certified organic, non-GMO foods. This is especially important if consuming corn, soy, wheat or anything made with them. NOTE: To minimize the amount of difficult-to-digest lectins in legumes and grains, soak and rinse them several times overnight before cooking until very well done. If you haven't been eating much fiber, it's best to begin gradually. And, since fiber absorbs and holds water, begin increasing your water intake as well. Your digestive system will get used to your increase in fiber but, at first, you may experience some more gas, bloating, cramping or diarrlhea until it does. This is normal and goes away fairly quickly. Keep high fiber foods readily available for snacks and meal preparation by storing cut celery, carrots or any other vegetables you like in a closed container of water in your refrigerator. Replace desserts with a piece of fresh, in-season fruit such as bananas, apples, pears, blueberries, strawberries, etc.. Snack on sprouted nuts and/or seeds kept in a closed container in your refrigerator. These are also great in salads. NOTE: Nuts will generally not sprout like vegetable or grain seeds. Add a handful to a quart jar with a tablespoon of sea salt or earth salt. Fill with water and store in a cabinet for 6 to 12 hours, depending upon the hardness of the nut. This destroys the enzyme inhibitors found in all seeds to prevent their sprouting before they have optimal temperature and water. Nuts are much easier to digest after elimination of these enzyme inhibitors. After soaking, pour off the water and place the sprouted nuts on drying trays in a food dehydrator to make them crunchy again. Drying can also be done by spreading them on cookie sheets and using the lowest temperature available in your oven. Almonds, hazel nuts, pecans, pumpkin seeds, sunflower seeds and walnuts are especially good prepared this way. Makes a great, lightly salted, nutritious snack.